Forget Monopoly! Lift your eyes above the petty ambition of owning hotels, buying streets, charging rent and passing "Go"! Here's the game in which you get to become Pope, no less, with a gazillion faithful Catholics around the world hanging on your every infallible word. 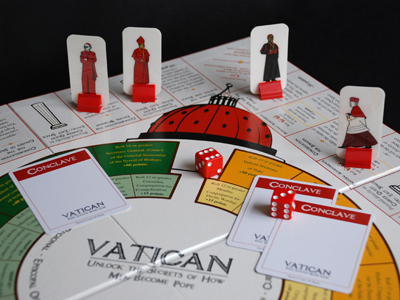 Vatican is a game played by six cardinals, who roll the dice in the quest to become papabile. On the long road to the conclave, they encounter all the usual Catholic preoccupations: stem cell research, theological censorship, Latin liturgical texts, beatification politics, visions of long-dead saints, and 101 other things which will... er... thrill and delight younger players. Play this, and the game promises to "unlock the secrets of how men become Pope". Ladies: check with your priest before playing Vatican, as it could be a mortal sin to pretend to become Pope. Only $39.95. Puff of smoke not included. Click here to order!